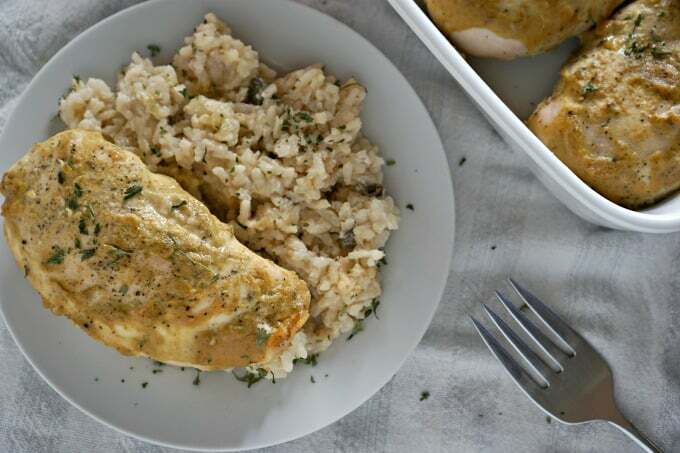 I was eating at a friend’s house a few years ago when she served this amazing dijon chicken-she called it her “Million Dollar” chicken-it was always a huge hit. She was right-it was delicious and she was gracious enough to share the recipe with me and allow me to share it with you! (Thanks Amy!) 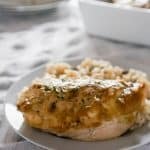 This Million Dollar Dijon Chicken is super easy to make-only 5 ingredients-and you really can’t mess it up. It’s flavorful without being overpowering and reheats nicely for leftovers as well-I hope you enjoy it! Preheat oven to 450 degrees and spray a 9 by 13″ casserole dish with nonstick spray. Lay chicken in a single layer in casserole dish and season liberally with pepper. In a small bowl combine mustard, syrup and vinegar. Mix until uniform and poor over chicken to thoroughly coat. Bake uncovered for 40 minutes or until meat thermometer reads 165 degrees. 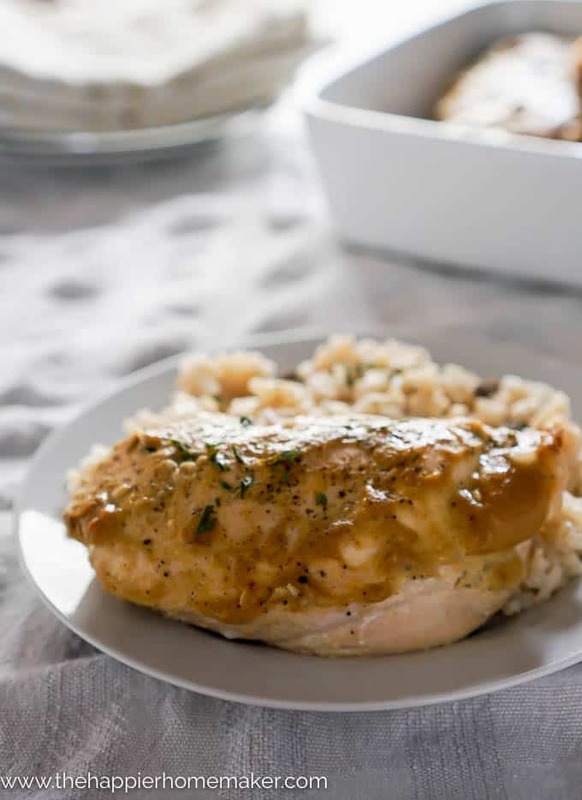 I served this with my favorite mushroom risotto recipe and green beans-it’s delicious and I definitely don’t normally consider myself a big chicken fan. I also love to heat it up the next day and chop it up to put in a wrap for lunch-it reheats well and packs a big flavor punch! 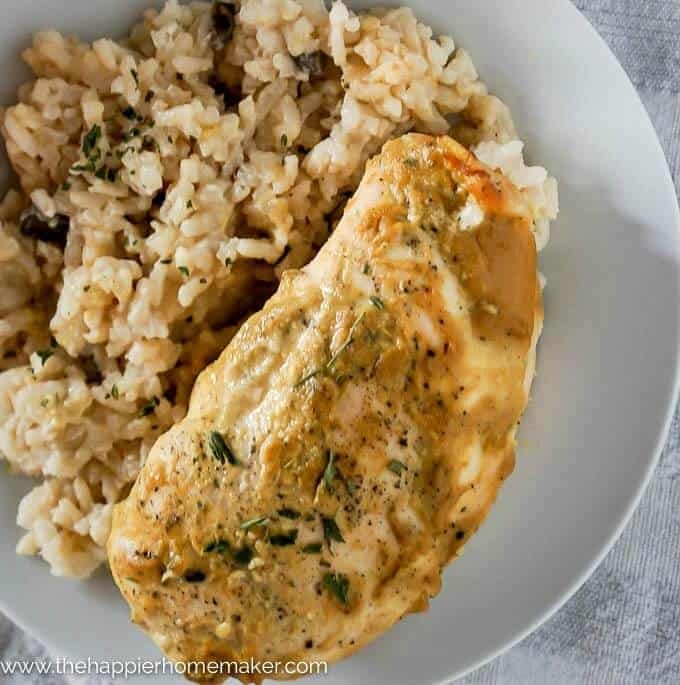 This easy to prepare Million Dollar Dijon Chicken has just 5 ingredients but is packed with flavor-the perfect easy weeknight meal! Preheat oven to 450 degrees and spray a 9 by 13″ casserole dish with nonstick spray. Lay chicken in a single layer in casserole dish and season liberally with pepper. In a small bowl combine mustard, syrup and vinegar. Mix until uniform and poor over chicken to thoroughly coat. Bake uncovered for 40 minutes or until meat thermometer reads 165 degrees.